It's always fun to hear from alums, and it's so fun for me to see how they are still in each other's lives long after they leave Middlebury. I know several of my own teammates were in my wedding, and we still cherish the times we get together and laugh about old times and share new moments of our lives. Thanks for sharing these moments!! First up, we have Jamie Wong ('06) Larson with her husband and two kids (welcome to the new baby!) in San Francisco with Katy Hicks ('05) visiting. Next up we have recent alums, Lizzy Reed ('15), Kathryn Haderlein ('16), and Katie Chamberlain ('16) all together visiting Lizzy out in CO. Lizzy recently spent two years at The Island School in the Bahamas and then moved to the snowy mountains of Vail, CO to teach at the Vail Mountain School. Quite a weather shift, but it looks like these guys are enjoying some warm water anyway, along with cake and some baked goods that we always all enjoy--Katie is a master baker, so did she make those, are were they just testing them out?! I always love to hear from alums out there, so forward any news so we can catch up and share with our extended MCVB family network! I'll also be traveling to Vegas the first weekend of April, and to Philadelphia the weekend of April 19-21 if anyone in either of those areas wants to meet up, just let me know! I just returned from the CO Crossroads National Qualifier where I often get to catch up with Amy Lowell ('01) Bloch and Dawn Trowbridge ('00) Marsh. This year was a quick trip for me, so I didn't see either one, unfortunately! Additionally, Lizzy and Amy Hart ('14), both live within range of the Denver area now, so hopefully next year we'll plan a mini MCVB Reunion in CO!! Eliana Schaefer ('18) was just back at MIDD visiting, so it was great to see her and catch up a little!! She's waiting to hear from a few more Medical Schools and will be headed somewhere next year to start that! We wish her all the best on that next path of life! Happy Spring to everyone wherever you are, and please send any updates you'd like to share with your MCVB Family! In typical Vermont fashion, the day after it's officially Spring, the wet, heavy snow is falling outside...and accumulating. It's snowy and slippery and practically a white-out out there! Ahhh, Vermont weather--and we thought we'd already started Mud Season! Claire Graduates Mid-Year on the Mountain! Here at Middlebury, we have a special mid-year graduation. It's call Feb Graduation. There are a whole class of "Febs" who actually start their Middlebury career in February and then end mid-semester as well four years later. These Febs (usually a mini-class of around 60 students) don the traditional cap and gown...and also some skis or snow shoes and then process down the mountain for their symbolic ceremonial procession! It's a unique tradition, and one that's quite a sight to see! This year, Claire White-Dzuro ended up having enough credits to graduate early, and thus became a "Feb" and took part in the mid-year graduation ceremony. She will be back in the Spring to take part in the formal Spring graduation ceremony, but she had a lot of fun with this mountain celebration! Congratulations Claire!! January term is a fun time at Middlebury. It's a time when students only take ONE class, so there inevitably ends up being a little more free time to enjoy various fun activities and take some short trips around the area. Some of the team went to Montreal for a couple of days at one point, and another excursion was a trip to the Ben & Jerry's factory, where several tackled the "Vermonster!" They had fun polishing off that huge bucket of ice cream sundae!! We also managed to have dinner (by class) at my house, at least with a couple of classes. I missed the juniors together, but I had lunch with Chellsa before she left for Spain, and Beth, who's staying around junior year for Track. Gigi's abroad program started after she went home for the Holiday Break, so I missed her completely. However, I decided to invite the freshmen and sophomores out to my house for dinner. I usually catch up with the seniors during Senior Week, but maybe we'll have to have them out to dinner soon as well, minus Claire who's already graduated! The freshmen came out and we made pesto pasta (fresh-frozen pesto, but made with basil from my garden this Fall). It was also their introduction to Annie, our newest family member. We adopted her from the Animal Shelter this Fall right after the entire team and their families came out to the house for our opening BBQ, so no one had met her yet. It's always nice for me to get to hang out with the girls outside of the season when it's not all about volleyball, and I think they enjoyed being at a house away from campus, and of course, they enjoyed playing with Annie! Then the sophomores came out another time and we made "make your own Pizzas!" Jaime hand-tossed one of the crusts, and we tried to recreate one of their favorite pizza's from Flatbread--the one with Balsamic, honey (and maybe maple syrup? ), basil, apple, and cheese...it was very good, whether or not it was just like Flatbread, I don't know?! We also made a margarita pizza, a meat lovers pizza with sausage, bacon and pepperoni, and a Hawaiian pizza with BBQ sauce as the base, and then pineapple, bacon, ham and cheese. They were all very different, and fun to make, and tasted great! For our Track team members, Beth and Emma, J-term meant a lot of track meets! They were home almost every weekend of January, thank goodness, and we got to see a lot of action. Beth wasn't competing for the most part, resting her ankle for the Spring outdoor season, but Emma was getting her start with the Shot Put, which was exciting! She's improving with this new event and we're excited to see how far she can progress for the outdoor season. Virtue Field House is the venue for Indoor Track, and when those meets are going on, it's a spectacle to see. There are TONS of people everywhere, and the best term for it seems to be, "organized chaos!" I tried to get a picture of it, but I didn't catch the full feeling. Just before finals started, we took some time last weekend to wrap up our season with our team banquet. 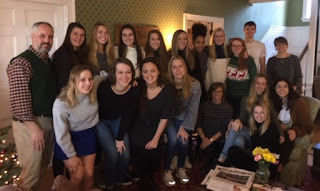 The parents graciously helped out, so we celebrated our season in style with brunch at the Swift House! Good food is always a high priority on our list, so it was a perfect way to celebrate our season. We handed out the many previously announced awards honoring our team members for their accomplishments on the court, and in the classroom. The first picture features our Academic All-NESCAC members, so a big shout out to those 5 (Claire, Isabel, Sarah, El, and Chellsa) for getting that nice honor. Well done!! The next picture is our Freshman class with their official Middlebury Varsity Letters! It's actually an old tradition that I still love. Many have put their letters on blankets, but Chellsa had hers made into a jacket, which was very cool! Then we have a picture of our Team Award Winners. Beth got the MCVB Spirit Award; Sarah got the Panther Pride Award, and Jane got the Yellow Jersey Award. The MCVB Spirit Award is given to the player whom her teammates felt consistently demonstrated the positive spirit of Middlebury Volleyball. Some of the comments for Beth included the following: "positive force on this team," "no matter the situation, Beth was always ready to compliment and encourage her teammates," "extremely selfless teammate," "made great efforts to keep everyone engaged on and off the court," and "positive mindset and always encouraging." The Yellow Jersey Award is to recognize the person who we felt gave consistent effort in practice on a daily basis throughout the season. I think it originated from the idea of the Yellow Jersey in the Tour de France years ago...Some of the comments about Jane included: "gave consistent effort in practice and made sure others were doing the same," " always made the effort to keep her game at a constant level to make the team stronger and better every day," " holds herself to a high standard and was a good role model for work ethic." These are some very nice words for our award winners from their teammates and is a nice culmination of our season. We strive for the unity of a family and the push and motivation of competitors, but always with a positivism that binds us together and keeps us moving forward as ONE. We are MCVB!! As has been my custom for a long time now, I get a Middlebury Blue fleece blanket with their number embroidered onto for each of the seniors. I've probably been doing this for almost 20 years (?). If any alumni are reading this and still have theirs, it would be fun to see a picture of you with yours and I'll create a collage! We also honored our current captains for all the tireless work that they did helping make our season as successful and drama-free as possible. I had mugs made (since we all like our coffee) with the team picture at one of our Dunkin' stops during the season so they can think of all of us as they enjoy a cup of coffee now in the off-season. Plus, we had tree ornaments made for Jack, Jill and Judd of the team on one side, and our "family" names on the back. Jill had to leave early, and so did Judd, so I got a picture of the "fellas" on the coaching staff. We had a real staff this year with not only Brian and I, but also Jack was back for his second year coaching, and Jill (who played at UVM, and is the current HS tennis coach) helped us out at most practices. Additionally, we also had occasional help from Jesse (who played at UVM and has done college coaching and officiating). He was able to come for the end of some practices and a few home matches. We're hoping to have them all back to help again next year, which would be great. The final two pictures are of our middle two classes (who weren't already featured). Fun times, and now everyone can focus on finishing up their finals and going home for break. Gigi is actually leaving campus for the rest of the year as she heads abroad for J-term and Spring term, while Chellsa will be returning for J-term and departing after that for her abroad experience. Our final junior, Beth, is staying on campus and running track again this year, so at least we'll have her around! That puts the sophomores in charge of our off-season activities, so it'll be a nice opportunity for that class to step up and be leaders. Happy Holidays to you all! Regardless of what Holiday you're celebrating, I hope it's a restful, thankful and emotionally energizing time of the year for you. The start of a new year, even in the middle of a school year, is a wonderful time to reflect and be thankful for all that we have that's good and positive, but also a good time of year to re-evaluate what's important and make some strides to be better versions of ourselves in the new year. Enjoy! More 2018 Awards from the AVCA, CoSIDA and NESCAC! The awards for Sarah and Isabel just keep coming, which is really great. Several others have also received awards that we'll highlight in here as well, but I'm very excited for them both to be garnering these very nice honors in their final year. First of all, both Sarah and Isabel were named to the AVCA All-Region Team (Northeast Region). 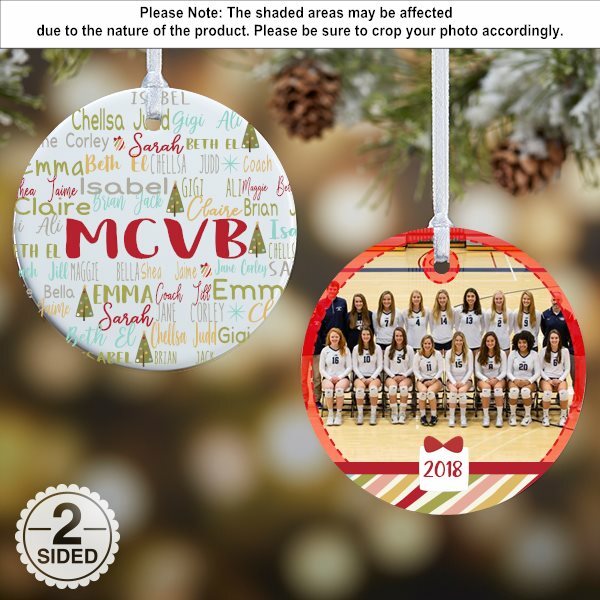 The AVCA (American Volleyball Coaches Association) is the National Coaches organization which is split into 10 different regions across the country. The Northeast Region has the second most member schools in it of the total of 437 Division III schools nationally. Additionally, they were both named to the Honorable Mention All-American list by the AVCA! Sarah was also named CoSIDA First-Team Academic All-District (District 1), and will go on a national ballot to be selected sometime in early December. All THREE seniors were just named to the Academic All-NESCAC Team, which is quite impressive, so congratulations to our trio of Seniors (Sarah, Isabel and Claire). Additionally, Sarah was one of only THREE athletes in all of the NESCAC who was on all three teams: All-Conference, All-Academic, and All-Sportsmanship! Well done, Sarah!! Our other (non-senior) members of the NESCAC All-Academic Team were Chellsa and El, so huge congrats to the two of them as well! We will certainly miss our three seniors next year, not only for their great volleyball skills, but also for their personalities and Team spirit! Thank you for all of your contributions and congratulations on these very nice honors! As we wind up the first semester, we will celebrate our season with a Team Brunch at a local Inn later next week, right before finals start. This is a nice way to end our semester, and then the long off-season begins. The team organizes themselves to play, keep working out, and do other fun team bonding things as well as some community service events. 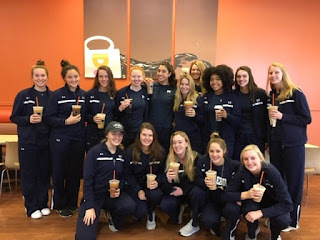 A couple of our juniors will be going abroad, so we'll hope to get updates on everything and post some fun happenings in the winter and off-season here in Middlebury to keep everyone up on MCVB. Both the NESCAC and the NEWVA Awards have come out, and we're still awaiting the AVCA awards. 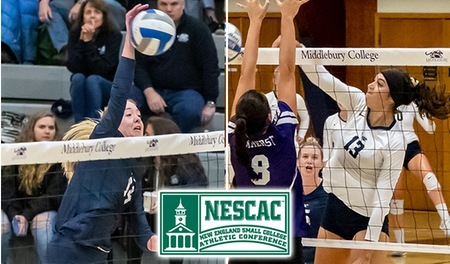 The New England Women's Volleyball Association voted Isabel to the 2nd Team, and Sarah to the Honorable Mention. Corley was voted onto the All-Rookie team, an honor that Isabel had four years ago as well. These honors are well deserved and tough to come by as there are 57 schools in the New England Region among which these three were selected. Then, the NESCAC awards came out today, honoring both Isabel and Sarah to the 1st Team. That's quite impressive as well since the depth of talent in the NESCAC is so great. Sarah was also selected as a member of the All-Sportsmanship Team, voted on by her teammates, so again, that's a nice honor given by her teammates. Congratulations to you all for these very well-deserved honors. It's always nice to be honored individually, but we all know that it's the TEAM that matters, and individual honors just help the team be the best it can be, and that's the most important thing! Well done, MCVB!! We were on the bus for almost 6 hours, through the driving rain and arriving in the dark, but we managed to get there earlier than we had the last time we traveled to Bowdoin for the NESCAC Tournament. Two years ago we had this same situation, heading to Bowdoin for the NESCAC's, playing Tufts in the 8pm Quarterfinal of #4 vs #5, but we arrived with only about 45 min on the clock before match time. All's well that ends well, and we prevailed that night, but all the same, we were happy to arrive on time this year! As the NESCAC does before the tournament, they like to put out the stats on each team, and not just the stats, but the history. For example, they reported that we were vying for our 6th overall Championship while Tufts was searching for their elusive 2nd one. We entered the tournament holding a 4-0 edge over Tufts in Tournament play (which I had to rack my brain to remember, but we'd beaten them twice in the finals, once in the semi-finals and once in the quarterfinals.) Anyway, it's all academic until the match starts, and nothing matters but how you play that day! At 8pm, our match started in the upper gym at Bowdoin Friday night. We played them very evenly during the first set, which saw them play much better than they had the first time we played them at home. They were passing better, and serving tougher and the match was a very even one, even though we didn't feel as though our game was as sharp as we'd like it to have been. We weren't controlling the action as we had when we played them at home a couple weeks beforehand, but it was a very competitive and evenly matched contest, as you'd expect in the Tournament. That first set was as tight as any we've played all year with no team having more than a 1 or 2 point lead the entire set, which took extra points to be decided, unfortunately for them. I went into the huddle between sets thinking no worries, this is what the tournament is all about, and we just needed to do a few things a little better. Our blocking was actually pretty good in that first set, and we were following our game plan pretty well, again, just needing to execute a few things a little better. Tufts was riding the wave of having won that first set, pulling it out at the end in extra points and we just needed to stay strong mentally ourselves to push through and fight. The second set was still very close, but we seemed to be behind by a couple of points most of the set instead of trading points and leads back and forth. We got behind 4 points at 16-20, but then closed the gap to 2 at 19-21, but couldn't seem to come up with points when we needed them and lost the 2nd set by losing the last three points on a service error, a receiving error and then a kill by Tufts. That seemed to be indicative of our destiny that day. Although we did fight for what would turn out to be the final set, we had way more errors than we'd been averaging for the season with one of our lowest hitting % nights and a 2-1 service error-ace ratio. When we tied the score at 10-10, that would be the last time we were even. We hung in there only behind by 1-2 points for most of rest of the set up to trailing 17-19. Tufts final push of 6 unanswered points put the nail in the coffin for us and ended our season. During the night, we saw two of our players be helped off the court with injuries, which is never a good way to go out, one late in the 2nd set, and one late in the 3rd. It's always disappointing to end the season on a loss, which happens to everyone in the country but ONE team. When the dust settles, I think we'll all look back on this season with fond memories and with good feelings. It was a successful season for sure, and we ended up being ranked in the top 10 in the Region and were getting votes for top 25 in the Country, which is new for us, so that's a good sign moving forward. The light didn't take long to shine on our team again as both Sarah and Isabel were named to the ALL-NESCAC 1st Team, which is a great honor with the depth of talent in the Conference! Congrats to both of them, and to the team that supports them! Well done, MCVB!! Sarah was also named to the All-Sportsmanship Team for NESCAC!